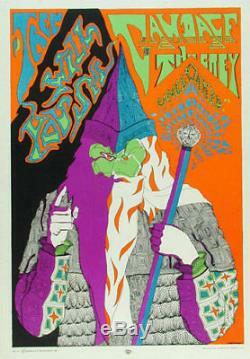 Gandalf The Grey Original 1967 Psychedelic Black Light Poster Lord of the Rings. Then Will You See Gandalf The Grey Uncloaked 14 x 20 inches All items are originals in near mint or better condition unless otherwise indicated. King Gallery - Since 1971 - Specializing in Rock Concert Posters and Sports Memorabilia Can't find it? We have over 6,000 rare and unusual items listed for sale on our website. Dennis King is the co-author and art director of Art of Modern Rock: The Poster Explosion. In 1977 he opened King's Baseball Cards, the first full time sports memorabilia store in California. Please visit us at D.
King Gallery if you are in Berkeley, just a 15 minute BART ride from San Francisco. _gsrx_vers_631 GS 6.9.8b6 (631). The item "Gandalf The Grey Original 1967 Psychedelic Black Light Poster Lord of the Rings" is in sale since Monday, August 21, 2017. This item is in the category "Entertainment Memorabilia\Music Memorabilia\Rock & Pop\Artists G\Graham, Bill\Posters".king" and is located in Berkeley, California.